To evaluate the effect of baseline factors on differences in vision gains with intravitreal aflibercept injection (IAI) versus laser control in patients with diabetic macular edema (DME). This was an integrated post-hoc subanalysis of two phase 3 trials (VISTA, VIVID) in patients with DME. Least square (LS) mean differences of patients treated with IAI compared to laser control in best-corrected visual acuity (BCVA) change from baseline at week 100 were evaluated for association with baseline demographics and baseline systemic disease characteristics. 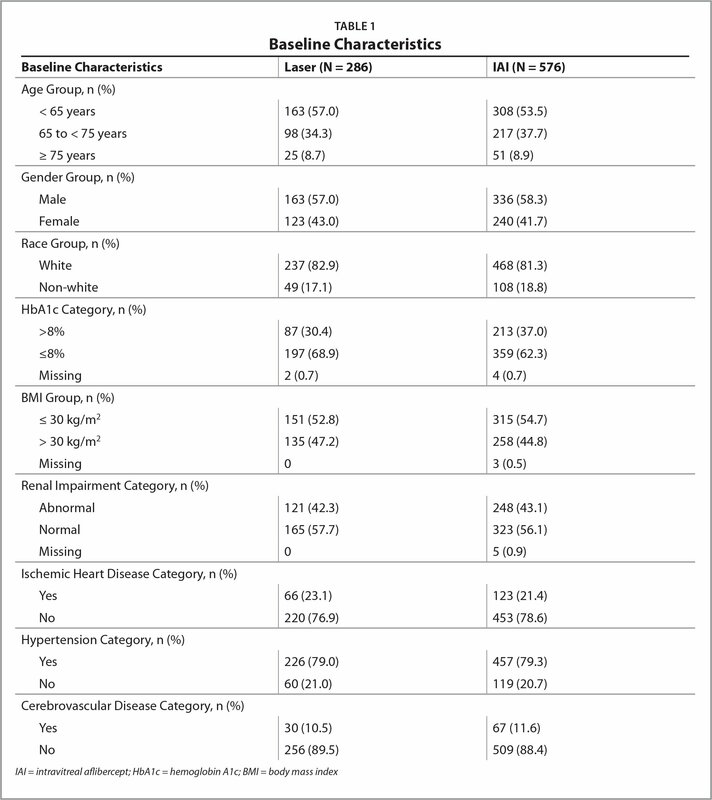 At week 100, LS mean differences in BCVA change from baseline with IAI compared to laser control were not significant for association with baseline age, gender, and race or status of glycosylated hemoglobin, body mass index, renal impairment, hypertension, cerebrovascular disease, and ischemic heart disease. Vision gains with IAI were significantly greater than laser control and were not influenced by demographics and systemic disease control at baseline. Diabetic retinopathy (DR) is the leading cause of new cases of blindness in adults, affecting almost one-third of diabetic patients older than 40 years of age.1 The number of Americans in the age group with DR and vision-threatening diabetic retinopathy (VTDR) is expected to triple in 2050, from 5.5 million in 2005 to 16.0 million for DR and from 1.2 million in 2005 to 3.4 million for VTDR.1 In particular, diabetic macular edema (DME) is the major cause of vision loss associated with DR and is characterized by exudation and accumulation of extracellular fluid in the macula secondary to an increase in vascular permeability.2–4 More recently, the standard of care treatment for DME has shifted from macular laser photocoagulation toward intravitreal vascular endothelial growth factor (VEGF) inhibitors following U.S. Food and Drug Administration approval of ranibizumab (Lucentis; Genentech, South San Francisco, CA) and intravitreal aflibercept (Eylea; Regeneron, Tarrytown, NY) injection (IAI) for the treatment of DME and DR in patients with DME. Several systemic factors, including duration of DM, serum hemoglobin A1c (HbA1c) level, blood pressure control, presence of nephropathy, and serum lipids may play an important role not only in the presence of DME, but also in its responsiveness to therapy.5–9 Evaluation of clinical difference between treatments has generally been limited to ocular characteristics, and there remains limited information available on understanding the effect of systemic factors on differences in treatment effect. Hence, the current post-hoc analysis was conducted to compare the response of patients with DME treated with IAI versus those treated with laser control by baseline demographic and systemic disease characteristics. VISTA and VIVID were two similarly designed, double-masked, randomized, active-controlled, 148-week, phase 3 trials. VISTA (registered at www.clinicaltrials.gov; NCT01363440) was conducted in the United States and VIVID (registered at www.clinicaltrials.gov; NCT01331681) was conducted in Europe, Japan, and Australia. Each clinical site's respective institutional review board / ethics committee approved the study. All patients provided written informed consent. Both studies were carried out in compliance with ethical guidelines of the Declaration of Helsinki and the Health Insurance Portability and Accountability Act. The study design and patient eligibility for the VISTA and VIVID trials have previously been described.10,11 Briefly, adult patients with type 1 or 2 diabetes mellitus who presented with central-involved DME (defined as retinal thickening involving the central 1 mm [optical coherence tomography (OCT)] subfield thickness [CST]) were eligible for enrollment if best-corrected visual acuity (BCVA) was between 73 and 24 letters (20/40 to 20/320 Snellen equivalent) in the study eye. Only one eye per patient was enrolled in the study. Eyes were randomized in a 1:1:1 ratio to receive either 2 mg IAI every 4 weeks (2q4), 2 mg IAI every 8 weeks after 5 initial monthly doses (from baseline to week 16) with sham injections on non-treatment visits (2q8), or macular laser photocoagulation (laser control) at baseline and at each visit during which a patient met any of the laser retreatment criteria, with sham injections at each study visit (laser control group). Eyes were treated through week 96. Study eyes in all treatment groups were assessed for laser retreatment beginning at week 12. If any Early Treatment Diabetic Retinopathy Study (ETDRS)-defined clinically significant macular edema was present (defined as thickening of the retina or hard exudates at ≤ 500 μm of center of the macula, or ≥ 1 zone of retinal thickening 1 disc area or larger, any part of which was within 1 disc diameter of the center of the macula), study eyes in the 2q4 and 2q8 groups received sham laser and those in the laser control group received active laser, but not more frequently than every 12 weeks. Study eyes in all treatment groups could also receive additional (rescue) treatment from week 24 onward if DME worsened and resulted in vision loss (at least a 10-letter loss at two consecutive visits or at least a 15-letter loss at any one visit from the best previous measurement, with BCVA not better than baseline). When these criteria were met, study eyes in the 2q4 and 2q8 groups received active laser (rather than sham laser) from week 24 onward, whereas those in the laser group received five doses of 2 mg IAI every 4 weeks followed by dosing every 8 weeks (rather than sham injections). Patients could receive both laser and IAI, when applicable, at the same visit. This post hoc analysis evaluates the relationship between select baseline demographics and systemic disease characteristics and mean change in BCVA at week 100. Specifically, the focus was on the influence of baseline age, gender, race, HbA1c, body mass index (BMI), renal impairment, hypertension, cerebrovascular disease, and ischemic heart disease. To remain consistent with prespecified groups defined in the original statistical analysis plan for the VISTA and VIVID studies, the same categories for age (< 65 years, ≥ 65 years to < 75 years, and ≥ 75 years), gender, and race (white or non-white) as well as baseline status of HbA1c (> 8% or ≤ 8%), BMI (≤ 30 or > 30), renal impairment (normal or abnormal), hypertension (yes or no), cerebrovascular disease (yes or no), and ischemic heart disease (yes or no) were evaluated. At baseline, HbA1c was confirmed by laboratory. BMI was derived from height and weight determined by the investigator and cut-points of BMI of 30 or less and greater than 30. Renal impairment, hypertension, cerebrovascular disease, and ischemic heart disease status was obtained from patient reports and medical history. Analysis of covariance test was used to assess the consistency of the treatment group differences (IAI – laser) for LS mean changes in BCVA at week 100 within the subgroups defined by selected baseline demographics and systemic factors. The model for change from baseline BCVA at week 100 included baseline BCVA, study (VISTA, VIVID), and a term for interaction (treatment by baseline demographic or baseline systemic factor). Least square (LS) estimates were reported. Significance was assessed at the 0.01 level. In this post hoc analysis, data from the VISTA and VIVID studies were integrated. Given the consistency of outcomes observed in the preliminary analyses in both IAI 2q4 and 2q8 treatment groups, data from these groups could be combined into a single IAI treatment group. The last observation carried forward methodology was used to account for missing data through week 100. Patient data were censored from the analysis at the time of rescue treatment. A total of 862 patients were included in the analysis. Overall, the mean BCVA at baseline was similar in the laser control (60.2 letters) and IAI (59.4 letters) groups. Patient distribution across baseline subgroups is presented in Table 1. The treatment groups were balanced across the evaluated baseline characteristics. In general, there were more patients younger than 65 years of age, more men, and more whites across both treatment groups. Additionally, there was a greater proportion of patients who presented with HbA1c of 8% or greater, BMI of 30 or less, and normal renal function status. There was a greater proportion of patients with hypertension and lower proportion of patients who presented with ischemic heart disease and cerebrovascular disease. At week 100, the LS mean differences in BCVA change from baseline for IAI compared to laser control for age were 5.9 letters (95% CI, 3.7–8.2), 4.7 letters (95% CI, 2.5–7.0), and 3.2 letters (95% CI, −2.1 to 8.6) in the younger than 65 years, 65 years and older to younger than 75 years, and 75 years and older subgroups, respectively (Figure 1). Consistency for LS mean difference in BCVA change between IAI and laser control was observed across all three age subgroups (P = .575). Similarly, for gender, the LS mean differences in BCVA change at week 100 from baseline for IAI compared to laser control were also consistent: 4.4 letters (95% CI, 2.4–6.4) and 6.6 letters (95% CI, 4.1–9.2) in the males and females subgroups, respectively (P = .151) (Figure 1). 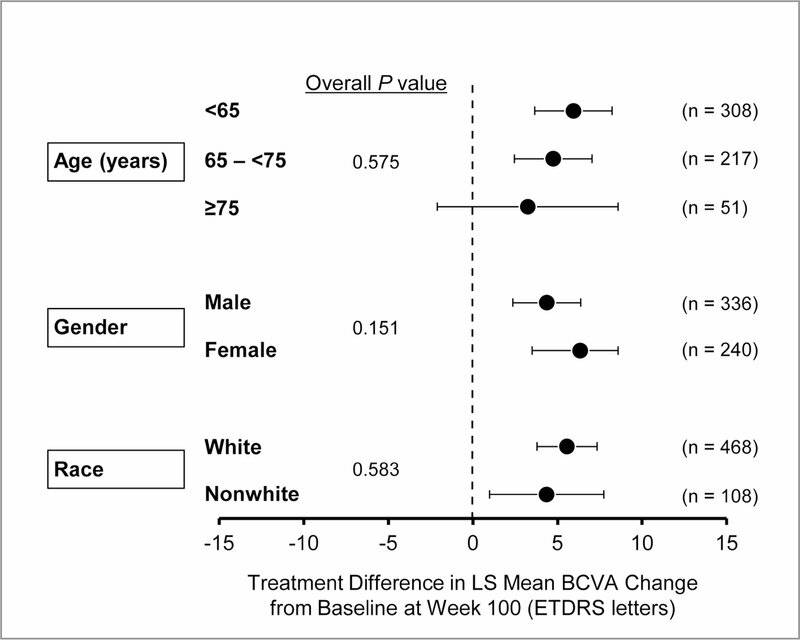 In terms of race, the LS mean differences in BCVA change at week 100 from baseline for IAI compared to laser control were 5.6 letters (95% CI, 3.8–7.3) and 4.4 letters (95% CI, 1.0–7.7) in the white and non-white subgroups, respectively, with consistency across the subgroups of whites and non-whites (P = .583) (Figure 1). At week 100, the LS mean differences in BCVA change from baseline for IAI compared to laser control for HbA1c were 5.9 letters (95% CI, 2.7–9.2) and 5.3 letters (95% CI, 3.6–7.1) in the greater than 8% and 8% or less subgroups, respectively (Figure 2). Consistency for LS mean difference in BCVA change between IAI and laser control was observed across both HbA1c subgroups (P = .728). 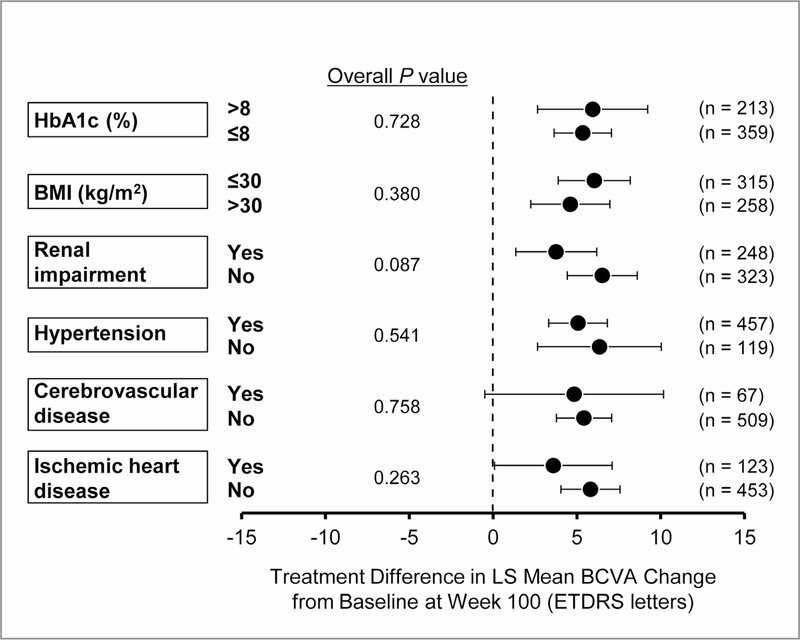 Similarly, for BMI, the LS mean differences in BCVA change at week 100 from baseline for IAI compared to laser control were consistent: 6.0 letters (95% CI, 3.9–8.2) and 4.6 letters (95% CI, 2.3–7.0) in the 30 or less and greater than 30 subgroups, respectively (P = .380) (Figure 2). In terms of renal impairment, the LS mean differences in BCVA change at week 100 from baseline for IAI compared to laser control were 3.8 letters (95% CI, 1.3–6.2) and 6.5 letters (95% CI, 4.4–8.6) in the abnormal and normal subgroups, respectively, with consistency across both subgroups (P = .087) (Figure 2). Similar observations were noted for cardiovascular-related factors (Figure 2). The LS mean differences in BCVA change at week 100 from baseline for IAI compared to laser control was 5.1 letters (95% CI, 3.3–6.8) and 6.4 letters (95% CI, 2.7–10.0) in a subgroup of patients with and without hypertension, respectively (P = .541); 4.8 letters (95% CI, −0.5 to 10.2) and 5.4 letters (95% CI, 3.8–7.1) in a subgroup of patients with and without cerebrovascular disease, respectively (P = .758); and 3.6 letters (95% CI, 0.1–7.0) and 5.8 letters (95% CI, 4.0–7.6) in a subgroup of patients with and without ischemic heart disease, respectively (P = .263). The overall results of the VISTA and VIVID studies demonstrated that treatment with IAI was superior to laser control in the change in BCVA through 100 weeks in patients with DME. Herein, additional assessment of the BCVA response by select baseline demographics (age, gender, race) and systemic disease characteristics (HbA1c, BMI, presence of renal impairment, hypertension, ischemic heart disease, cerebrovascular disease) demonstrated that IAI outperformed laser in each of the respective subgroups identified. The effect of baseline HbA1c on visual and anatomic outcomes following treatment with IAI or laser control in the VISTA and VIVID studies was recently evaluated.9 Even though the focus of the analysis was on evaluating trends of baselines HbA1c effect within individual treatment groups, this data also suggested the benefit of IAI over laser control across the baseline HbA1c subgroups. Our results are consistent with the findings of Mitchell et al., who reported that all evaluated patient subgroups, including select demographics (age, gender) and systemic disease characteristics (type of diabetes, duration of diabetes, HbA1c, blood pressure, triglyceride, total cholesterol) on average had higher mean change in BCVA with ranibizumab as compared to laser treatment.12 Although the systemic disease characteristics analyzed may not be identical in the two analyses, the totality of the data demonstrates the benefit of anti-VEGF therapy over laser for patients with DME. There have been additional reports on the effects of relevant baseline characteristics on treatment outcomes in patients with DME.5–8 Generally, these analyses have been limited to evaluating the impact of anti-VEGF treatment response and did not include a control group like the laser control group in this analysis. The comparison in the current analysis provides additional evidence of IAI benefit over laser photocoagulation in patients with DME and may further support the current treatment shift towards anti-VEGF therapy in the management of patients with DME with varying disease severity. It is important to note that even in the patients included in the VISTA and VIVID studies who can be presumed to have inadequate control of their diabetes (as indicated by their baseline HbA1c > 8% as well as potentially by their reported history of renal impairment, ischemic heart disease, and cerebrovascular disease), the treatment benefit of IAI over laser control in terms of visual outcomes was consistently observed. These data support use of IAI over laser even in patients with DME who might not have optimal control of their diabetes. Additionally, since the studies were conducted across multiple countries, the data provide a good representation of the DME population worldwide. However, it should be noted that although some of the disease characteristics were confirmed by a laboratory, others were investigator determined or patient reports. The analysis was also unable to account for certain aspects of the systemic disease (eg, gradation of level of renal impairment). There are limitations inherent to a post hoc analysis that are applicable here. The subgroups were not consistently balanced, but the strength of the analysis lies in the dataset acquired from two large, prospective, randomized global clinical trials. The primary outcome of mean change in BCVA was based on measurements conducted by personnel masked to treatment assignment. In summary, this study provides evidence that improvements in vision achieved with IAI were consistently greater than those with laser control in patients with DME regardless of their demographics or presenting systemic disease characteristics. Vision Health Initiative: Economic studies. CDC website. http://www.cdc.gov/visionhealth/projects/economic_studies.htm. Accessed February 7, 2018. From Cole Eye Institute, Cleveland Clinic, Cleveland, Ohio (RPS, FQS); and Regeneron Pharmaceuticals, Tarrytown, New York (AG, DT, RV, AJB, NS). Data included in this manuscript were partly presented at the American Association of Diabetes Educators, New Orleans, LA, on August 5–8, 2015. The VISTA and VIVID studies were funded by Regeneron Pharmaceuticals, Inc., Tarrytown, NY, and Bayer HealthCare, Berlin, Germany. The sponsors participated in the design and conduct of the study, analysis of the data, and preparation of the manuscript. Dr. Singh has received grants and personal fees from Regeneron during the conduct of this study, as well as grants and personal fees from Alcon and Genentech, personal fees from Shire and Biogen, and grants from Zeiss outside the submitted work. Drs. Gibson, Thompson, Vitti, Berliner, and Saroj report personal fees from Regeneron during the conduct of this study. Dr. Silva has no relevant financial disclosures to report.